When you need a baby gift, look here for something truly one of a kind. Personalized mobiles, memory blocks, and etched wooden toys can be made to order. We have incorporated special accents from the baby room decorations and even replicas of favorite toys. Our baby memory block is made from a 3" solid maple cube. (Additional sizes may be available in the future.) 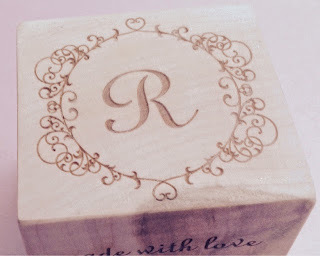 Each side has an etched component that makes each block a one of a kind gift. Corners and edges are sanded smooth. Additional messaging with us is required to confirm details for all 6 sides of the block. When you check out, leave specific requests in the message. I'll confirm details before final etching is completed. Visit our Etsy shop to place your order for the solid maple wood 3" baby block.